Water breathing doesn't increase the distance in order to see underwater as compared to no water breathing. 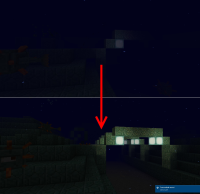 In one of the photos I've attached, The player is standing directly in front of an Ocean Monument. You can barely see the Monument from a short distance. If you were being attacked by a guardian from long range, you wouldn't be able to see the attacker. This is a HUGE problem! 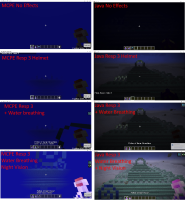 I really don't want to compare this with the PC version BUT you can clearly see everything in front of you (in the other photo) with the water breathing enchantment. From the distance I was standing, I was able to see the whole monument in all it's glory. 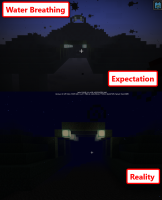 In MCPE you hardly see anything! Attached is a related issue MCPE-17092 around 0.15.90. Water texture filters allowed better visibility but the visibility wasn't consistent.